A 140 hp Testastretta engine, steering dampers and the new monobloc brakes mean that with the 848EVO even more exhilarating performance is guaranteed. 848EVO - the most exciting way to enter the world Ducati Superbikes. Contact us for more information on the 848 Evo and other Superbike models available at Ducati Manchester UK. Ducati Superbikes, designed, engineered and built in Bologna, Italy, have always represented the pinnacle of Ducati motorcycle technology and racing success. For Ducati, racing and winning are a way of life and a way of thinking for our designers, engineers and everyone at the factory. Our unique engineering solutions are proven on the race track, where the only way to win is to have technical superiority and dependable performance. Ducati have dominated World Superbike racing, winning more Riders' and more Manufacturers’ World Championship titles and more individual races than any other manufacturer. Add these unequalled performances to the historic achievement of winning the MotoGP World Championship, and the results speak for themselves. The “EVO” treatment applied to the 848 introduces a 6hp power boost to 140hp and a torque increase to 10kgm that results in a razor-sharp and easy-to-use power delivery. The 94mm x 61.2mm bore and stroke 848EVO engine is a fitting reward to Ducati's ingenuity and a clear result of the continual attention to detail and development of their twin-cylinder technology. Ducati Superbikes are the most advanced, most powerful twin-cylinder motorcycles ever built. They are the product of a team of designers and engineers who have combined their Ducati MotoGP and World Superbike technologies to create the finest sportbikes in the world. From race-level engine specifications to World Championship-winning traction control, the results are pure excellence. The Ducati Traction Control (DTC) system further underlines our technology flow from racing to production and demonstrates how solutions developed for the track can be applied to enhance safer performance on the road. Ducati Superbikes are race bikes, pure and simple. Their striking aerodynamic shapes create a natural riding position, confirmed by our development and factory team riders as the optimum for speed and agility. Performance is first and foremost in every detail. Trademark Ducati features like the high tail section and compact front end combine with twin under-seat silencers and single-sided swingarm to express the sheer engineering beauty of aerodynamics and agility. Add the Testastretta Evoluzione engines as the hearts of the machines and the result is all-out performance Ducati Superbikes that look fast even when parked. 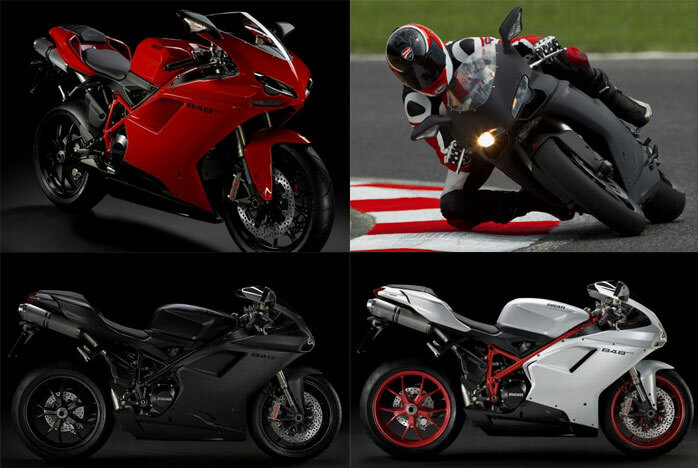 The Ducati 848 Evo is available in 3 colours: Dark Stealth, Arctic White Silk or Red. Customise your Ducati Superbike 848 with our full range of 2014 Ducati 848 Parts & Accessories online. Also at Ducati Manchester we have a full range of 2014 Ducati 848 Clothing & Accessories available at our online Ducati Store. We offer a range of affordable finance options on new & used 848 Evo motorcycles.